Cortaflex HA Canine & Feline Jointcare is a complementary feed supplement to support healthy joints in dogs and cats, as part fo a balanced diet. Made with a unique formulation and fortified with hyaluronic acid (HA), Cortaflex targets natural wear and tear of the joints and helps keep them lubricated and as healthy and supple as possible. 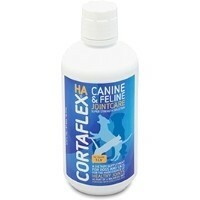 Use Cortaflex as part of your pets daily routine to support healthy joints for life.